Appointing bed czars // instituting an electronic bed-tracking system // parking patients in other departments // improving triage // and other small but significant changes. All night, every night, like overcrowded emergency rooms across the country, the ER at the Massachusetts General Hospital serves as a haven for the sick and injured, such as Guy Orgis, who was suffering back pain. It’s a gray Monday in March, just past noon, and Alasdair Conn, the emergency room chief at Boston’s Massachusetts General Hospital, is facing the daily crunch. He has almost two dozen patients languishing in the ER, and although he’d like to send several upstairs to one of the patient care units, no beds are available. There isn’t any particular reason for the gridlock, no horrible traffic accident or flu outbreak. The hospital is routinely swamped, and the ER must compete for inpatient beds that are also needed for admissions from other departments, particularly surgery. There’s also a constant influx of patients transferred from outside facilities. This kind of traffic jam is typical for hospital emergency rooms, particularly in metropolitan hospitals, almost two-thirds of which experienced overcrowding in 2003 and 2004, according to a report by the U.S. Centers for Disease Control and Prevention. But things are often just as bad at suburban and even rural ERs. “Emergency rooms are mobbed all over the country,” says Jesse Pines, an assistant professor at the University of Pennsylvania School of Medicine and a physician in the ER of the university’s inner-city Philadelphia hospital. That’s hardly news to the approximately 114 million patients who seek treatment in ERs each year. Some are rushed in with grievous injuries or illnesses and may get immediate care, but many others arrive with less obviously urgent problems, and they know it could take hours to be seen. Yet in numerous cases, because they lack health insurance or can’t find a primary care doctor, they continue to go to the ER. They’re often joined by a growing population of older patients who have fallen or have chest pain and were told by their regular physicians to get checked out at the hospital. That adds up to an emergency care system that is stretched to the breaking point, according to three reports published in 2006 by the Institute of Medicine, an arm of the National Academy of Sciences. The IOM found that ER visits grew by 26% from 1993 to 2003, while the population increased just 12%, and the United States suffered a net loss of 703 hospitals and 425 emergency departments. The problem is exacerbated, according to the IOM, by a shortage of nurses and a lack of specialists willing to be on call for emergencies. 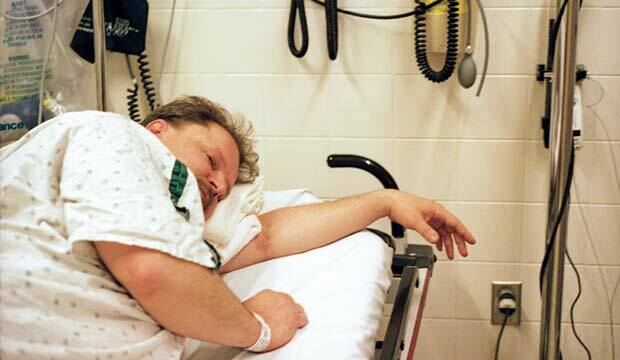 Sometimes, delays in overstretched ERs prove fatal. In a recent survey of 1,496 emergency department physicians by the American College of Emergency Physicians, about 13% of respondents said they knew of a patient who had died after waiting too long for care. And a recent Harvard Medical School review of more than 90,000 emergency room visits across the country from 1997 through 2004 found that one in four heart attack patients had to wait almost an hour to see a doctor—even though any delay in treating a heart attack greatly increases the risk of death. According to the IOM reports, most ER departments are particularly ill prepared to cope with large-scale disasters. “You can’t help fearing a flu pandemic,” says Sandra Schneider, the former chief of emergency care at Strong Memorial Hospital at the University of Rochester Medical Center in New York. Expanded facilities might help relieve the bottleneck, and the MGH is building a $495 million, 10-story facility that will increase total beds to 1,052 and expand ER capacity by 15 when it opens in 2011. But many hospitals can’t afford that kind of investment or can’t get regulatory approval for expansion. 1. Future of Emergency Care, Institute of Medicine, 2006. A collection of three comprehensive reports examining the challenges and potential solutions to ER overcrowding. 2. urgentmatters.org. This Website for Urgent Matters, a national initiative funded by the Robert Wood Johnson Foundation and dedicated to easing ER overcrowding, offers valuable reports, Webinars and best-practices information. 3. “Bursting at the Seams: Improving Patient Flow to Help America’s Emergency Departments,” by M. Wilson, K. Nguyen, The George Washington University Medical Center, 2004. An account of how 10 U.S. ERs developed and tested strategies to reduce patient flow bottlenecks, with varying results.